The Commonwealth special envoy Ibrahim Gambari has proposed a road map for dialogue in a bid to maintain peace and unity in the country. Professor Gambari proposes a number of mechanisms that include dialogue between the PF and the UPND Presidents, another layer that should include all stakeholders and some capacity building workshops for key members of the defence and security services. 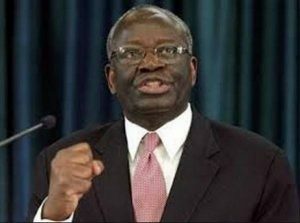 Professor Gambari further suggested that a steering committee of eminent persons be constituted to help watch developing issues that might threaten peace and stability be put in place. He said the proposed strategy should result into the establishment of a long-term high-level conflict prevention national peace architecture in the country. Professor Gambari proposed a time frame and milestones that include an agreement that structures be set up in December 2017 and that dialogue commences in January 2018. He since encouraged political parties and other stakeholders to remain focused, committed and support a conducive environment for a result-driven dialogue process. He was representing the Commonwealth Secretary General, Patricia Scotland QC, and has been in the country since Wednesday. He held several consultative meetings with political parties, the Judiciary, the Church and CSOs before having a press briefing on Sunday to propose the road map. This is tantamount to interfering with affairs of a sovereign nation. There is no war in Zambia . Commonwealth is not a supreme government over other nations and has no legal mandate over the affairs of our nation. This body is a voluntary association which any country formerly a Colony of Britain can choose to either associate with or disengage from it . So even the president should put his foot down and not be pushed around by an association . Zambia is not a colony of any nation or for that matter a mere association. Trump has walked out some associations which he feels are not good for his country. Britain has walked out of the European Union. So please let us not be controlled by some uninvited guest who have their own agenda. Sounds like a useless proposition to me – a waste of time. It seems Dr. Gambari wants to bring into the country some “governance experts” to lecture Zambians on democracy – some NGO-type arrangement. What contentious issues do we have in the country? Some arrogant politician refusing to accept the will of the people is not a crisis – there are enough laws to deal with that as was shown recently. Let’s not prop impunity. The Kenyans just wasted time and resources. Mike,abilima,Ngosa, if u don’t see anything wrong with Lungu and his pf government then your brains need surgery and chainama has to do the job you are useless trio who are a loss to yo family shame on you bustards.